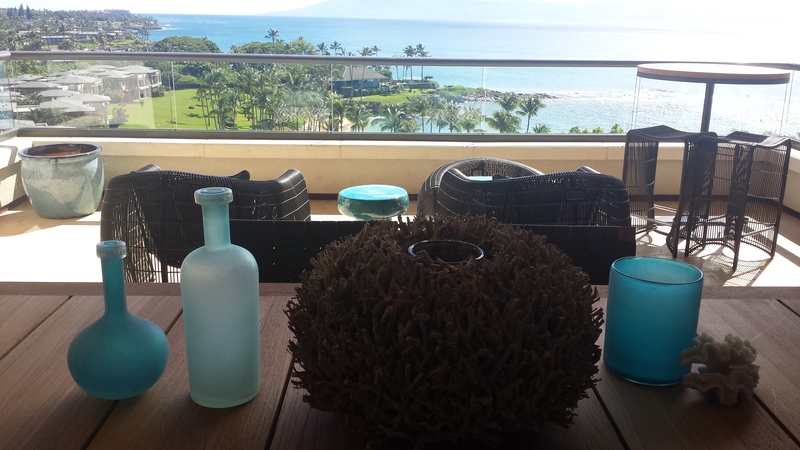 Watch a video of the view from Montage at Kapalua Bay main lobby. This past Saturday after showing properties to buyers and holding an open house at 116 Pulelehua at Pineapple Hill (my wonderful listing view here: www.116Pulelehua.com), I stopped by the Montage Residences at Kapalua Bay with my business partner Heleena Oliveira. We were invited to the soft opening this past spring but at that time, (read about the history of this property in my article here http://livingonmauinow.com/2014/04/07/the-montage-residences-kapalua-bay-taking-reservations/ ) the prices still weren’t set and they still had to get through the State of Hawaii procedures to offer it for sale. We have seen some brisk activity lately so I wanted to check in and view the updates and renovation. according to the salesperson at Montage, buyers who are very familiar with the Montage collection of luxury properties have bought here in Kapalua. He said they wanted to get in before the prices climb. Along with Kapalua Bay, the other Montage Hotels are at Beverly HIlls, Deer Valley, Laguna Beach and Palmetto Bluff. Montage is devoted to delivering an elevated guest experience. A key part of all Montage Hotels & Resorts is a commitment to refined living. Guests can expect impeccable hospitality, exceptional epicurean experiences, world class spas and an elegant yet welcoming ambiance with the goal of creating lasting and cherished memories. Pursuing this vision is a dedicated team of talented individuals with decades of experience in the art of hospitality. Knowledge and passion for exceptional personalized service are the foundation upon which this property management company is built, and these desires are infused in each destination. The Montage Residences at Kapalua Bay are in the luxury price range of approx. 3 million to over 8 million. Currently the highest price sold is unit 1401 sold on Aug. 22, 2014 at $8,250,000. Stunning unit and at $2035 price per square foot, a great price considering this is Oceanfront Maui, vacation rentable, brand name with five star reputation, service and amenities. Keep in mind that ocean, beachfront condos on Maui have been sold at over $4000 price per sq. foot. See link here to see what is currently offered for sale, pending and sold in 2014. Call us for more details and updated units for sale and developer price list. The Montage Residences at Kapalua Bay has finally opened its doors and is now offering its residences for sale. In total there will be 50 residences offered for whole ownership. Currently there are a limited number of residences in Building 1, 5, 2 available to show. All are 3 to 4 bedroom suites ranging in 2789 SF to just over 4000 SF of interior living space. Each residences comes with spacious lanais. Email us for floor plans and current price list. Here are some benefits that Montage offers to its owners. 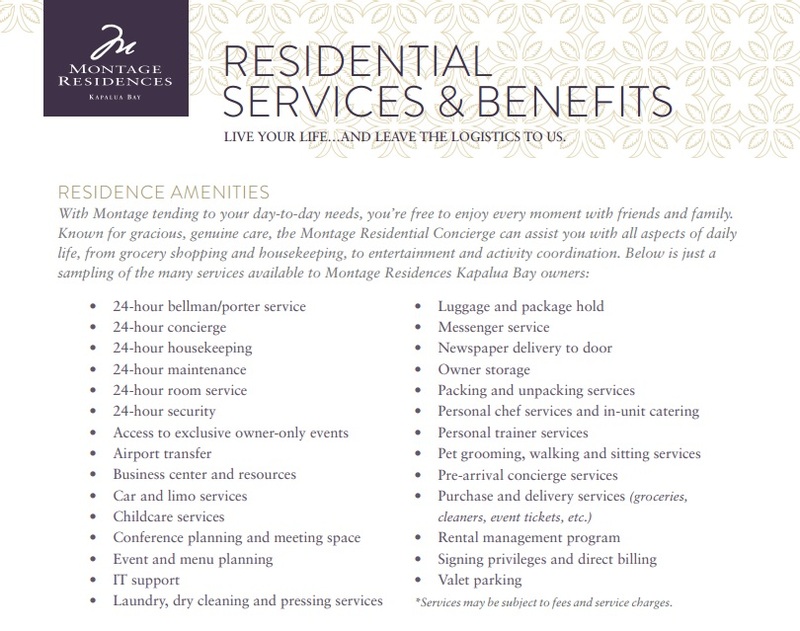 Call us today 808-276-1832 or 808-280-1951 for updated list of Montage Residences for sale. These luxury properties are zoned Hotel/Resort so an owner can hire a Montage approved rental management company to offer your residence as a vacation rental. Owners can receive income and have the flexibility of use. This option, even in this luxury price range, have been considered by many owners. If you have interest in receiving more info on Montage at Kapalua Bay, floor plan, units for sale and rental management info, current maintenance fees, then please call/email Jeannie Kong REALTOR ®(S) or Heleena Oliveira REALTOR® (S) today. Mahalo for reading. Please call or email us for updates on Montage, and Maui Real Estate.